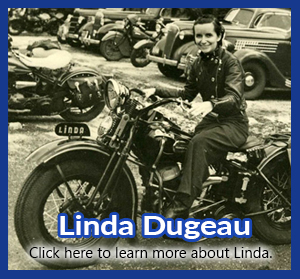 Linda Dugeau – Motor Maids Inc.
Linda was born in Cape Cod, Massachusetts on May 15, 1913. Her future husband, Bud, taught her to ride on a Harley Davidson motorcycle at 19 years of age in 1932. Stories about her early tours appeared in the pages of Motorcyclist magazine. 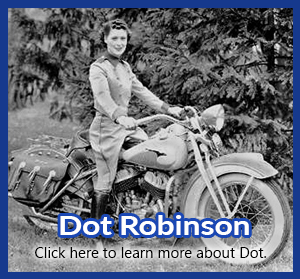 In 1938, she began a letter-writing campaign to establish a national network of female motorcyclists who owned and rode their own machines. Thus was born the Motor Maids. 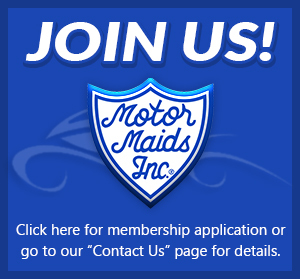 In the 1930s, women riders were so rare that it took Linda and Dot Robinson, three years to locate the charter members of The Motor Maids. 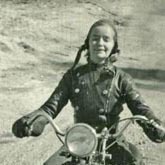 The organization was chartered with the AMA in 1941, making it the oldest motorcycle organization for women in North America. Never one for the spotlight, Dugeau remained in the background, but strongly influenced the organization’s selection of strong leadership, including Dot Robinson and Vera Griffin. In the 1950s, Dugeau moved to the Los Angles area, primarily so she could ride year round. She became a motorcycle courier and often hosted tours of Southern California that featured off-road riding in the mountains and the then-undeveloped San Fernando Valley. Dugeau had a reputation as one of the best female off-road riders in the 1950s. Linda was an avid touring rider. One summer she took a trip that covered 3,500 miles in two weeks. During that trip she visited the Harley-Davidson factory and was a guest of Bill Davidson, visited her mother in Michigan and rode to the World’s Fair in New York City. On another solo trip she toured the wilds of Canada on then nearly impassable roads in uninhabited areas. Dugeau passed away in February 17, 2000 at–just four months after Dot. She was 86. Thanks to pioneers like Linda, the ranks of women riders continue to grow. Today, women comprise as much as 9% of all new riders, and the organization she conceived continues to thrive.